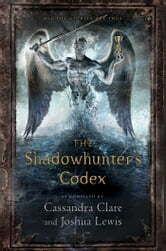 Since the thirteenth century, the Shadowhunter’s Codex has been theone and only manual for Shadowhunters looking to brush up on their demon languages, learn proper stele use, and discover just what exactly a pyxis is. Featured in both The Mortal Instruments and The Infernal Devices, this guide is a necessity for any young Nephilim on their journey to becoming a Shadowhunter. Beautifully illustrated, the Codex contains images of the famous Shadowhunter homeland of Idris, as well as depictions of demons and other Downworlders. This book is really good for fans of the Mortal Instruments and Infernal Devices series; it provides not only an in depth study of weapons, Shadowhunter history and the secrets of Downworld, but is also filled with beautiful illustrations and a selection of rune drawings. Perfect for any Shadowhunter!